Hi, welcome to the weekly flower update of Tulips in Holland. Yes, I have spotted the first crocus field of the season. I almost wondered if there were no crocus fields this year. When you drive from Keukenhof to Langevelderslag (in the direction of the beach) you will find it on your right hand side. Unfortunately I couldn’t get close enough to make a photo so I drove further to find other fields. There aren’t many more fields in bloom compared to last week. The weather was a bit colder than the week before. There are a lot of daffodils at the point of starting to bloom, when we have a couple of warm nice weather they sure will bloom soon. Next to Keukenhof at the side of the windmill there will be a daffodil field as well. Especially for the visitors early in season this will give a nice view from up the windmill. I found this field close to Teylingen. 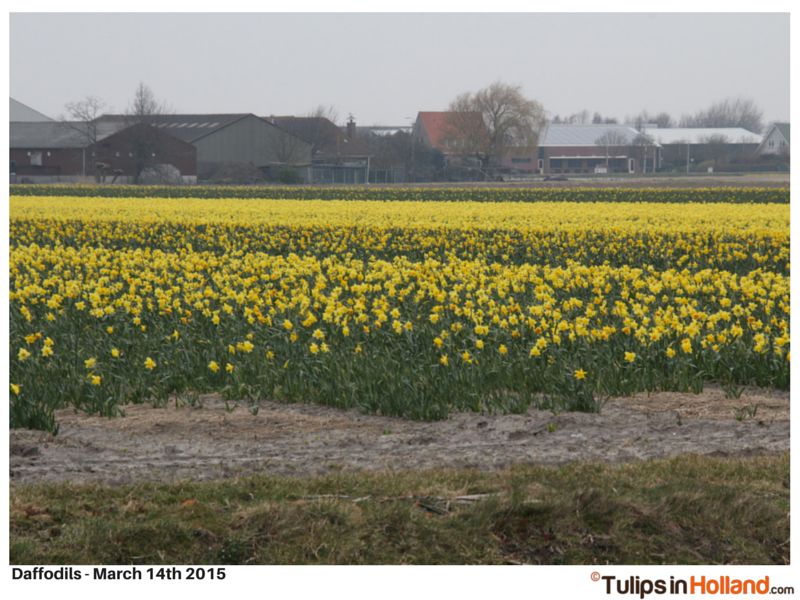 Last Saturday I visited a lovely tulip farm to check on the tulips. When you drive around the area you can spot some plastic in the flower fields. This keep the warmth at the bulbs and flowers so they can grow a bit faster. And i was very curious how it looked. Together with the bulb farmer I took a peak underneath to see what the status is. And sttt …. they are still asleep. The tulips under the plastic grow a bit faster and some of them might be in early bloom somewhere in the next weeks. This week is openingsweek of the Keukenhof. I am looking forward to the opening. At some of the twitter accounts from bulb farmers you can see some early inside photos of lots of crocus in bloom. Will post some photos from Wednesday evening. About the forecast for next week: More daffodil fields in bloom. It is too early for hyacinths and tulips for this moment. The expected weather is not extremely warm or cold for the time of this year. At this point still expecting a regular springtime this year with tulips blooming in the fields from the 2nd/3rd week of April. I got a question this week about the blooming. The fields don’t bloom all on the same time. They are starting to bloom – then get to peak blooming – and just after peak blooming the tulips in the fields (not at Keukenhof) will be topped. 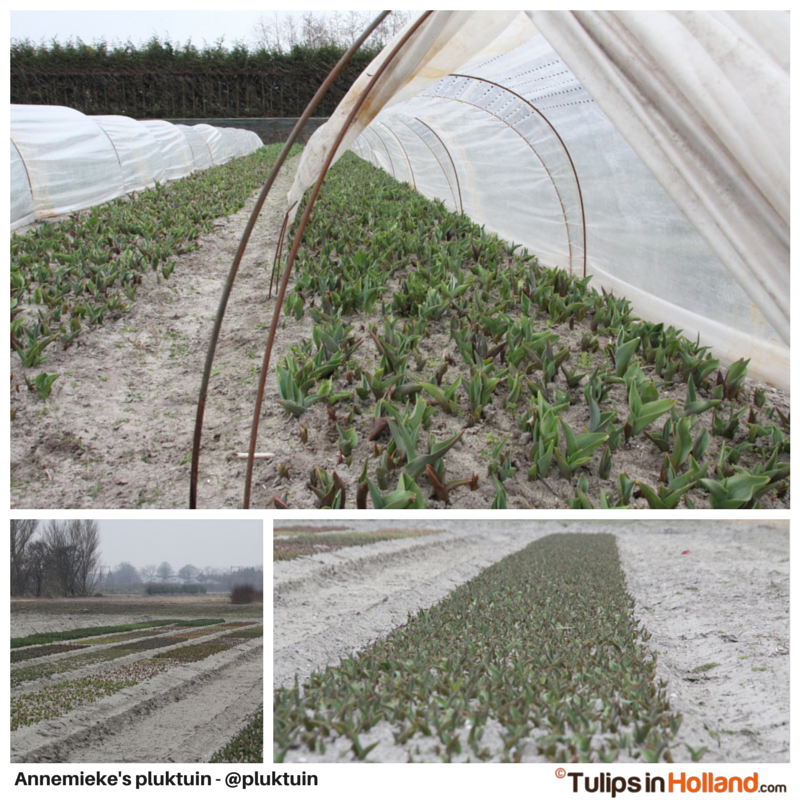 (More about topping tulips) This proces will take around 3 weeks. At this point I expect blooming tulips in the fields around the last 2 weeks of April and 1st week of May. And it is still nature, so in case of warmer/colder weather things can change.